Ask or tell us about the MacLeod Clan, and we'll add the information to this page. fortress on Skye for 700 years. There are two main branches of the MacLeods, the 'sons of Leod' of the Isle of Lewis, who was son of Olaf Lord of the Isle of Man and the Northern Isles.These two branches descended from Leod's two sons, Tormod and Torquil. Tormod was the ancestor of the MacLeods of MacLeod, of Glenelg, Harris, and Dunvegan. From Torquil came the MacLeods of Lewis and the MacLeods of Assynt. Torquil was the 2nd Lord of Lewis, and his family held the island until thrown out by the MacKenzies at the beginning of the 17th century; they held Assynt much longer. Tormod MacLeod claimed the chiefship of the whole clan. One of his descendants supported Robert the Bruce. His son Malcolm MacLeod received a charter from David II (1329-70) giving him Glenelg lands. By then, the chiefs were calling themselves MacLeods of MacLeod. William, the 7th Chief, was killed in a feud with the MacDonalds; he had already acquired Dunvegan. 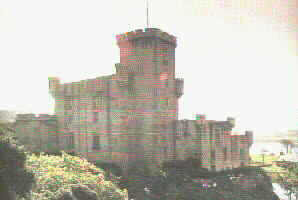 His son Alasdair Crotach, the 8th Chief received a charter from James IV for Trotternish at the end of the 15th century. After the death of the 8th Chief, there was a long-drawn-out dispute over the chiefship, but by the beginning of the 17th century Rory Mor MacLeod was recognized as 16th Chief. He was knighted in 1603 and died in 1626. The clan supported Charles I in the Civil War, and some of them fought for Charles II at the Battle of Worcester (1651). After the Restoration in 1660, the MacLeods felt a major grievance that Charles II had not been sufficiently grateful for their exertions on his behalf, and they never supported the Stewart kings again. The MacLeods took no part in Claverhouse's campaign of 1688-89, nor in the first Jacobite rising of 1715. In the second rising (1745-46), the MacLeods raised a battalion for the Government forces. Torquil's line continued until the 16th century, but after the death of Malcolm, 9th Chief of the MacLeods of Lewis, there followed years of dispute over the chiefship. In the early 17th century, the direct MacLeod line became extinct and the MacKenzie Earls of Cromartie obtained the Chiefship of the lsle of Lewis. The Raasay estate remained in the MacLeod family until it was sold in the 1840s. It is pleasant to quote some comments on the MacLeods by the clan historian, Dr I.F. Grant. Throughout the history of the MacLeods there runs a thread of tenacity that worthily fulfils their motto, 'Hold Fast'. In nothing is this staunchness better shown than in the maintainance of the bonds uniting the chief and his clansmen.
. . . doctors were maintained . . . education was fostered, and heavy expenditure incurred in road-making. MacI.eod's private post to Edinburgh was for long a boon to the community Grain was imported in times of scarcity . . . the MacLeod estates were never sullied by the blot of clearing the people from their holdings.